Did you know that the bicycle was invented in 1817? This early version had no steering, pedals, or brakes and was made entirely out of wood. Lucky for us, we’ve come a long way with more comfortable and safer options today.Bicycles are a source of enjoyment and entertainment. They provide youth with physical activity and a way to visit their friends and explore their surroundings. 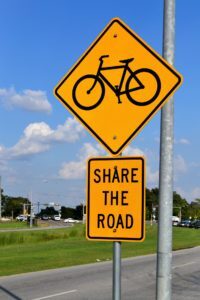 As adults, most of us have been riding our bicycles since childhood, so it can be easy to forget what a first-time bike rider needs to know. 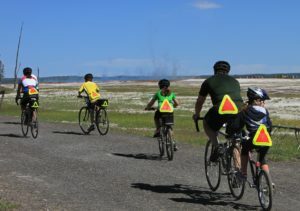 Although lessons on safe cycling may not be met with much enthusiasm, it’s the information your children need to know! 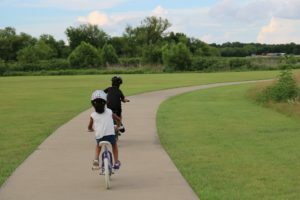 May is National Bike Safety Month, and as many schools begin summer break, it’s important to start the conversation about bicycle safety tips for children and other beginner riders before the tires hit the pavement. Before entering any street or intersection, check for traffic by looking left-right and left again to make sure no vehicles are approaching.​ Once in traffic, always ride on the right side of the road so you are traveling with traffic.